3:12 p.m., Oct. 16, 2008----J.A. Leo Lemay, Henry Francis du Pont Winterthur Professor of English, died on Wednesday, Oct. 15. He was 73. Prof. Lemay, of Newark, Del., joined the University of Delaware faculty in 1977 as the Winterthur Professor of English. He earned his bachelor's and master's degrees from the University of Maryland and his doctorate from the University of Pennsylvania. One of the nation's leading Benjamin Franklin scholars, Prof. Lemay spent decades researching Franklin for a seven-volume biographical work, being published by the University of Pennsylvania Press. The first volume covers Franklin's life up to his 1730 marriage and explores previously unknown influences on Franklin's philosophy and writing. Volume two covers the period between 1730 and Franklin's retirement from printing in 1748. It assesses Franklin's writings up to that point and notes the birth of William Franklin, Franklin's illegitimate son. Volume three, covering the period from 1748-57, is scheduled to be published this month. The first two volumes were reviewed and praised by such periodicals as the Journal of American History and the Library Journal. The New York Sun selected both volumes for its "best books of 2006" list. "Lemay's in-progress biography of Franklin is...magisterial," a staff writer at the Journal of American History wrote in a review in December 2006. "His Life of Benjamin Franklin is the fruit of a lifetime of careful, dedicated and loving research, and we are all the richer for it." 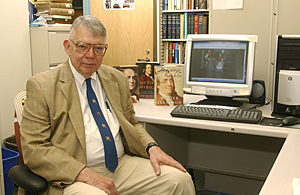 In 1997, Prof. Lemay launched a Web site chronicling Franklin's life [www.english.udel.edu/lemay/franklin]. He also published an earlier, critically acclaimed book on Franklin, Benjamin Franklin: Writings, which was cited in best-selling books on Franklin by Walter Issacson, Gordon Wood and Edmund Morgan. His other books include Robert Bolling Woos Anne Miller (1990) and The American Dream of Captain John Smith (1991), published by the University Press of Virginia, and Did Pocahontas Save Captain John Smith? (1992), published by the University of Georgia Press. Prof. Lemay's honors include a Guggenheim fellowship, a National Endowment for the Humanities fellowship, a Huntington Library fellowship, grants from the American Philosophical Society and Colonial Williamsburg and being named a Distinguished Scholar of Early American Literature by the Early American Literature Group of the Modern Language Association. He is survived by his wife, Ann, a daughter, Kate, and two sons, John and Lee. A memorial service will be held at 3 p.m., Friday, Oct. 24, in the Gore Recital Hall of the Roselle Center For the Arts.